iTablet Teaching: the impact made on engagement and achievement. 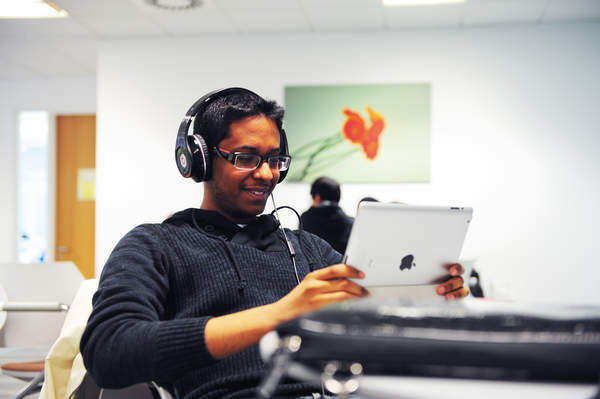 It has been six months since Tim Powell-Jones, Diploma Learning Technologies Coordinator at INTO UEA London, introduced iPads as learning tools to his students on the International Business Diploma programme at INTO UEA London. His motivation: to develop new ways of helping students understand the content in their subject classes and engage with English language and culture. Following on from Tim’s first blog in July of last year, what impact has this technology made on the classroom dynamic? So far the programme seems to be going very well from a teaching point of view. It’s not just the iPads, but rather the knock on effect on how people are teaching, and how we are able to get far more value out of existing technology. Many of the ideas in my previous blog post at the start of term have provided a starting block, but what has also happened is that tablet computing is helping reduce technology anxiety and acting a catalyst for many teachers to embrace technology in the classroom. Much of the really successful stuff has been ‘hidden’, and related to issues of study skills and engagement with material. Massively increased use of the VLE has been one interesting result. Students and teachers are using Moodle extensively for communication and feedback as opposed to just a passive repository for materials, and all students have had access from pretty much the first week of term and it has become the infrastructure underpinning many of the classes. This, coupled with improved university email access and calendar synchronization from Academic Support, has led to students being less likely to get left behind early on. Of course, the creative features of the devices have also allowed us to do things not previously possible, such as a series of student produced videos explaining concepts from Organisational Behaviour. We have worked with students on helping them use the iPads take notes and organize their study effectively, and are beginning to see the results of this their lectures. Classroom observations have been key – observing what students are already doing and helping them do it better. This has led to the adoption of Dropbox to help class workflow and simple PDF annotators over complex note taking programmes. In all classes observed, the overwhelming majority of students are on task and concentrating on the material; rather than being a distraction, the iPad is being used by students constructively to check concepts, take notes in lectures, and participate in activities in English classes. It is important to us that International students get a feel for the local community here in Whitechapel, and they have been out in the local area recording interviews about skills and the workplace, and using the iPads to help with primary qualitative research to support their first term presentation. All student text books are provided as eTextbooks, and these also seem to be fairly successful, they are a key aspect of English classes as well as subject classes and the students genuinely appreciate the CLIL* approach that this allows. I was initially worried about how students would view the transition for paper text books, and while I’m not sure yet that students would claim to prefer the electronic version, they are clearly very comfortable using them, use them more often than previous intakes opened the paper books, and most annotate them effectively. 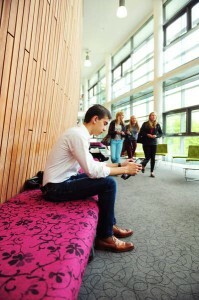 Students are also able to use e journals and UEA’s database search functions, because they have been able to practice this in their classes consistently, as opposed to special ‘media lab’ sessions – this has definitely not been the case in previous years and should hopefully lead to a better understanding of how to use genuine academic texts. Due to these features, we have been able to almost completely do away with published EAP material in English class. A knock on effect of this is that English teachers have been putting more work into producing online/digital resources, and the more of this we have, the more effective any future programmes using iPads will be. All of this seems to have led to an increase in engagement with the concepts that students are learning and an improved appreciation of the student experience itself. We can already see marked improvement by looking at where we were in a few key areas this time last year. Students are actively using the VLE to download lectures, post in forums, and engage with video content. Also, overall EOT marks have improved markedly in nearly all subject modules, which has been helped by subject integration in English classes that the iPads have allowed. Based on our student satisfaction survey, overall satisfaction has leapt from 60% to 85%, and attendance is improving as well, from a 2011-12 Term 1 average of 82% to a current Term 1 average of 91%. The infrastructure we’ve put into place around the tablets needs to be kept up, and there is plenty more we can do with new apps like Explain Everything and Nearpod, while also taking better advantage of internet and social network access. Some teachers clearly need more support than others, and CPD sessions will be ongoing in 2013. I also hope to run more workshops with the student representatives to look at ways of improving what we are doing in the classroom from a learner point of view. This was an important idea in my previous blog post at the start of the course, but one that has somewhat fallen by the wayside. The next stage is to produce more content specifically tailored to a classroom in which all students are online. We have already been producing video lectures to help with the Business, Economics, and Organisational Behavior courses, and hope to continue with this as well as producing supplementary materials with Moodle and eLearning software such as Captivate and Storylines. The other big idea in HE that is running parallel with mobile devices is of course that of the Massive Open Online Course (MOOC), and the guiding principles behind these of connectivity and self-guided learning are very relevant to what we are trying to do with technology in our center. Providing online content for access, any time any place is great, but thinking about how students can use location specific content created on their iPads to contribute to an online course, and collaborate with partners in different schools and countries, would be a fantastic goal for the future. You can read Tim’s progress from the past six months and keep up-to-date with developments via his INTO iPad Pilot blog.